Novara should be more of a recognizable name in the bicycle touring realm. 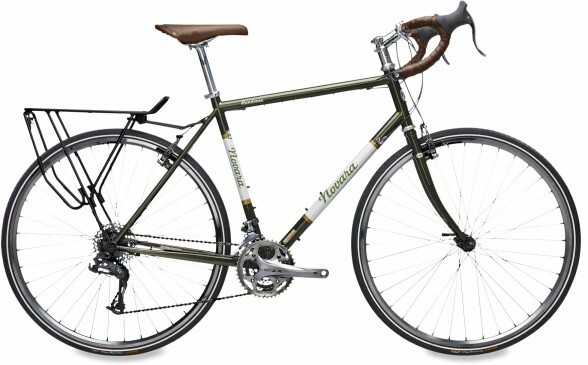 Although Novara isn’t really a go-to touring brand like Surly, Cannondale, and Trek, the Novara Randonee is just as well-made and durable as a touring bicycle manufactured by any of those brands. When I showed up to a six-week group ride across America with my Randonee, people questioned its ability to make it across the country without mechanical issues. Despite their reservations, my Randonee had fewer issues than any of the other bicycles. That’s not to knock other brands — that’s just to say that the Randonee can hang in there with the best of them. My Randonee has been with me for several thousand miles of touring now, and I would not have chosen any other bicycle to have carried me and my belongings so far. The Randonee is designed for serious tours, though could also be used as a commuter bicycle if you’re prepared to haul the Randonee’s weight – it’s steel, so it’s on the heavy side (around 28 pounds). If you use this bicycle for touring, expect not to have to make many mechanical changes — for the most part, the bicycle is durable exactly as it is sold. Not only is it durable, it’s comfortable without making many modifications, unlike many other bicycles. After just replacing the saddle and adjusting the headset, I found riding pleasant. You can’t say that about all bicycles. The Randonee is built so that you don’t have to modify it, and the frame is built to last. As a result, you don’t necessarily need to be a bicycle expert to enjoy a tour with the Randonee – you probably won’t need to worry about fixing it, so you can simply enjoy the smooth ride it provides. When in the market for a touring bicycle, I also considered the Trek 520, Surly Long Haul Trucker, and even a modified Bianchi Volpe. Why, then, the Randonee? Its features equaled or excelled that of all the other models I assessed, and its price was reasonable (on sale, it was a steal). It is a purchase I would definitely make again. The Randonee is sold in five sizes: 47” (XS), 52” (S), 55” (M), 57” (L), and 59” (XL), so the Randonee will fit most anybody. The frame is steel, so while it is heavy, it absorbs ridges in the road for a very smooth riding experience. There are 30 gears, spanning, obviously, enough of a range that there are comfortable settings for both climbing and descending even mountains. The tires are size 700c Vittoria Randonneurs, which, as will be discussed later, are extremely durable. The handlebars are drop style, as expected of a touring bicycle. The brake components are Tektro brand. Overall, the Randonee has the features expected of a touring bicycle. The elements are high-quality and the bicycle was clearly designed for long distances; the lengthened chainstays with extra spokes, room for fenders (not included), and even three water bottle mounts all show that this bike was designed with the long-distance rider’s needs in mind. The Randonee is just about as expensive as the other touring bicycles you’ll come across – R.E.I. sells it for about $1200. Look for sales, though; I bought my Randonee in late February 2009 and paid only $875. I purchased mine in the store, off the rack, and the staff was very amenable – they allowed me to ride the bicycle around the nearby neighborhood for as long as I liked and sufficiently answered all of my questions; they knew the bicycle backward and forward, which I appreciated. If your size bicycle is not in stock, R.E.I. will order the bicycle and have it assembled for you when you pick it up. The staff at R.E.I. will likely throw in a few free accessories, like toe clips (not huge savings when you’ve just spent hundreds. I’d also recommend avoiding the stock R.E.I. toe clips – they fall apart within three weeks). Riding the bicycle was also extremely helpful for me in deciding whether or not the bicycle was suitable. I could tell immediately that the stock saddle was not going to work for me, so I switched it out for a nicer one while I was there. It was convenient, and I got a $10 credit toward the new saddle by giving them the stock saddle. Other than that, the bicycle rode extremely cleanly – the brakes worked perfectly, it took turns easily, it was comfortable, and it made the road feel smooth. The bicycle technically doesn’t come with options or upgrades. You buy it “as is” and then can swap parts (for example, receiving the $10 credit for exchanging my saddle) as allowed. The bicycle comes with a rack. All you should need to purchase separately are pedals, toe clips, and water bottle cages. Of course, you’ll need to stock up on the extra parts necessary for touring, such as an extra chain and spokes. The only out-of-the-ordinary accessory I would suggest picking up – and this is a bit picky — is extra bar tape. The bar tape on my Randonee was not only wrapped the wrong way when I purchased it, but also was also very thin, and became worn through within only a few hundred miles of riding. I’d definitely pick up some more durable tape. It seems petty, but it’s worth noting. Most of the (very few) problems I experienced with the Randonee were to be expected, considering how much wear I put the bicycle through. I did watch one of my rear brake pads crumble as I repaired a flat, but those brakes had not been replaced in 3000 miles of rough terrain (including the Rockies and the San Bernardinos). The cables (shifting cables, not brake cables) loosened up pretty quickly within the first two weeks of riding the Randonee high-mileage (as is expected of new bicycles), but they required adjustment every two days throughout those two weeks. After that initial period, however, I experienced no further problems with them. Minor point, but if you’re picky about the paint on your bicycle, be careful with it, because the paint on the Randonee chips easily. I’d also point out one more thing – the headset was of some concern for me after I took a minor tumble and it shifted dramatically. Keep an eye on the headset, and tighten its screws frequently. The worst thing about the bicycle, though, is definitely the stock saddle. It was very uncomfortable, and if I could change anything about the Randonee, it would be not having to spend an extra $40 (that’s after the credit) to upgrade to a decent saddle. The tires on the Randonee are extremely reliable. On my 3000-mile cross-country ride, I got just three flat tires. Because it’s steel, the bicycle rides extremely smoothly – you definitely won’t feel all the bumps in the asphalt. The rack is solid – my belongings always felt sturdily-positioned. The brakes are dependable as long as you monitor the wear on your brake pads. I experienced no problems at all with the derailleurs. All together, the Randonee is fantastic – it’s the overarching elements of the bicycle that I found strong and lasting, and only small components where I found room for complaint. The Randonee’s best features, I would have to say, are how incredibly smooth it feels to ride it – it really does seem to absorb small cracks and bumps in the road – and how durable the tires are. Nobody likes flats, and with the Randonee’s tires, you won’t have many. I would wholeheartedly recommend this bicycle to riders looking to tour long-distance. I would not recommend it as a commuter bicycle (at 28 pounds, it’s not worth the extra weight just for commuting). Its components are high-quality and made to last, and the bicycle was clearly designed for the comfort of the rider. This bicycle is made to go long distances, and I certainly plan on covering much, much more distance with my Randonee. Author Bio: Elise Riley is currently a college student at Emory University in Atlanta who has dedicated her summers to long-distance bicycle touring. Elise’s most extensive tour was a six-week, 3000-mile journey from Savannah, Georgia to Los Angeles, Calfornia. This entry was posted in Bicycle Touring Pro Articles, Bicycles, Guest Posts, Main Articles, Product & Service Reviews, Products and tagged novara bicycle, novara bicycle review, novara bicycles, novara bikes, novara randonee, novara randonnee, randonee review, rei bicycle, rei bicycle reviews, rei bicycles, rei bikes, rei novara, rei novara randonee, rei touring bicycle. Nice review and a few comments on this bike which I own and actually use as a commuter bike in NYC. Even though I own 4 bikes I choose to commute with my circa 80’s Novara Radonee Touring bike in NYC for my 46 mile RT commute. I have outfitted it with full coverage SKS fenders and with them I could ride a 700 x32 tire but prefer 700 x 28’s in the city. REI is a great company and stand behind their products waaaaay beyond other stores I know of (check with REI for details). I’ve been riding the REI Randonee for at least 5 years and the bike has many thousands of miles (About 6000 if I were to guess). I would take it on any ride (at least in N America) without hesitation. The original tires lasted 4K-5K miles without a flat. The second set got a flat when a utility knife blade cut the rear one sideways. I used one of the originals as the replacement while I waited for the new tire to arrive. I’ve had no unexpected problems. Yes the cables stretch. Yes there are uncomfortable seats. I’ve tried expensive seats that hurt. I’ve tried cheap that felt good. Can’t blame the bike mfr for that. The only major problem occurred when I crashed and broke the left Tiagra STI shifter (maybe I should not have been looking at that car for sale). I highly recommend the Randonee based on my experience. Bike snobs my thumb their nose at it. Think of it this way … I once listened to an $80,000 pair of speakers that were nice but not $79,000 better than the speakers I had. There is “good enough” and the Randonee exceeds that threshold while leaving $$$ in your wallet for other cool things. I have one myself (2010 blue model) that I use for touring and commuting as well. It’s true that it’s a bit on the heavy side, but have had no problem thus far. I’ve swapped out many parts since then, and I’m lovin it! Good review. I have an ’09 Randonee that is my commuter and all around bike. No self-supported extended tours, but I just rode it this past weekend for my first double-century (OK, back-to-back centuries), the Seattle to Portland Classic. The bike performed beautifully, as it has in the last 2 years & 5000 miles of commuting and sub-century rides. It’s amazingly stable at speed. I’m no racer, but I’ve had the bike above 40 mph on downhills, and it felt solid as a rock. Part of me wants a ligher beast for the sub-century summer rides, but the Randonee is so reliable and smooth that it’s hard to justify another bike. I found the stock saddle in ’09 (Fizik Nisene) to be perfect for me, but I’ve heard the complaints of others. Note that the Randonee has changed some since ’09 and ’10. It is now fitted with bar-end shifters, which some like for distance touring, but which I think I would object to in my hilly commuting environment. Bar-ends are simpler, maybe more reliable and less expensive than brifters. I suspect that ‘less expensive’ might have been REI’s motivation for the change. Also note that the new models are equipped with linear pull rather than cantilever brakes, in case that’s important to you. I have an older 1998? randonee that I used to do Portland to SF 12 summers ago, and commute with daily. Yes it’s heavier than my Mondonico Racing bike, but smoother and takes panniers. Mine was the 1st year with a threadless headset, and I wish it was threaded, but once dialed in not a big deal. So, clearly a bike to go the distance. Do keep in mind that the components have changed much over the years, but the Deore LX stuff on the 2012 models is frankly, better than the RSX on mine, yet mine still rolls on and on – Proof that a high end ride is not needed. I have one that I use for my touring bike. It is great, but mine is pre bar end shifters so I am going to upgrade to dura-ace bar end shifters this week. It really is a great rig. I find it amusing that your review stated the bar tape was wrapped the wrong way. When I bought mine some 3 years ago now, it had the same exact issue. My friend that I have done almost all my tours with has a Surly LHT and my rig is every bit as good, if not better in some aspects as his. I would recommend this rig to anyone looking to tour. I just took delivery for a 2013 Navara Randonne. It came with Deore LX hubs, Sram X7 RD, Sram High-end FD, and Deore LX Cranks/bottom bracket. The rims are the rigged, MAVIC A319S 3X tensioned wheelset. Not a bad bike for loaded touring and better, the ride is very smooth as a direct result of the time-tested Reynolds 520 tubing. The bike, when properly tuned after the break-in period, will run flawlessly. Mine came with the cheap seat and post. What a let-down after seeing what the bike had besides this saddle/post. This bike would be great with a carbon seat post and a Brooks B17. My tires are the Continental touring plus. 700x32C. Bullet proof, kevlar-type, rubber and just as reliable as my Gatorskins on my Basso Firo de lotto Campagnolo-equipped, SLX tubed time machine. This bike will carry you anywhere with ease. Just as durable as anything out there for small money. Happy touring everyone. Check your bike frequently and ride safe. Semper Fidelis. Thanks for review, one of the few I could find on the randonee. Great bike, very happy with my recent purchase. Excellent component spec for the price especially since REI frequently has it at 20% off . Ride is very comfortable and stable. My only complaint is the seatpost, I’ve never had to use so much force tightening a seatpost to avoid slippage. I have owned my Randonee since 1991 and have probably 18k miles on it. I have toured Nova Scotia twice and ride it daily for exercise. I will be retiring soon and will be celebrating by purchasing a new Randonee for elderly adventures. I have the 2013 Randonee which I mostly use for putzing around town, driving to the pool, exercising, etc. I also took it on a cycling tour through France last summer for about a week. I love the bike no matter what I use it for. The geometry fits me, its sturdiness gives me options of road quality and cargo weight. I have crawled up mountain passes – only to race down on the other side, loaded without any wobbling. I have had no mechanical issues to speak of. I’ve had it in airplanes several times, on trains and cars. I find it easy to maintain all the major parts. Most importantly, I really enjoy riding it!